***Please note that the time listed were not the actual time instead it’s the closest estimated time. Places to visit which are accessible via tricycle tour. Mode of Transportation: There were tricycles and multicabs for inland public transport. For touring, you may avail of the tour from the hotels and travel agencies, you may also rent a tricycle for a day and rates will depend on the number of spots you want to visit, or rent a motorbike which is 300.00-350.00/day and you pay for the + gas. Motorbike is the best option for those who has a drivers license and know how to drive because spots there are many places to see that are not accessible with tricycles. Amazing place! 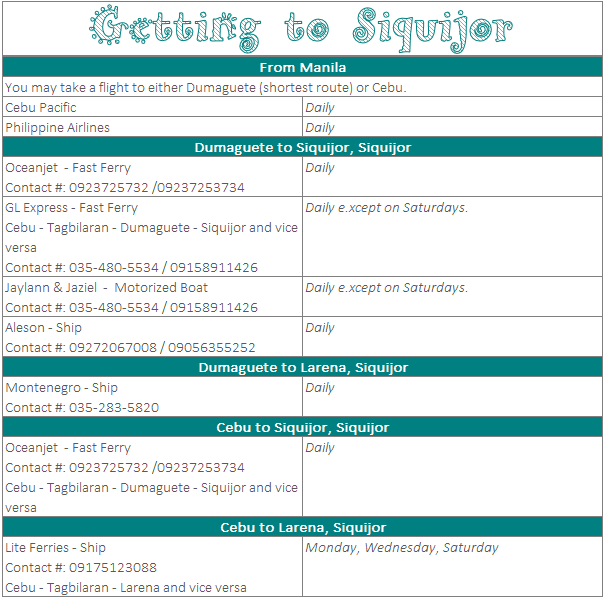 I am planning to go to Siquijor alone and a bit nervous! Thank you for this very helpful post. wow! its going to be exciting :) enjoy! Thanks for this informative post! Planning to stay there for 3D2N soon as well. May I know if accessibility to restaurants/convenience stores in the San Juan area won't be a problem? Are they walkable from each other or is there quite a distance that I would have to hail a ride? I'm a bit concerned on how to go about at night. Thank you! These blog sites became my guide in my DIY tour of Siquijor. But there was hardly any mention of warning for reports of theft at different tour sites in the island, especially at Cambugahay falls. I never thought I would fall prey to thieves while eating famous breads at Lilibeth's Pan de Bisaya at Larena. So keep your eyes on your valuables. You're not anymore at Dumaguete.